SBP-BRiMS is a multidisciplinary conference with a selective single paper track and poster session. The conference also invites a small number of high quality tutorials and nationally recognized keynote speakers. The conference has grown out of two related meetings: SBP and BRiMS, which were co-located in previous years. Social Computing harnesses the power of computational methods to study social behavior, such as during team collaboration. Cultural Behavioral Modeling refers to representing behavior and culture in the abstract, and is a convenient and powerful way to conduct virtual experiments and scenario analysis. Both social computing and cultural behavioral modeling are techniques designed to achieve a better understanding of complex behaviors, patterns, and associated outcomes of interest. Moreover, these approaches are inherently interdisciplinary; subsystems and system components exist at multiple levels of analysis (i.e., “cells to societies”) and across multiple disciplines, from engineering and the computational sciences to the social and health sciences. 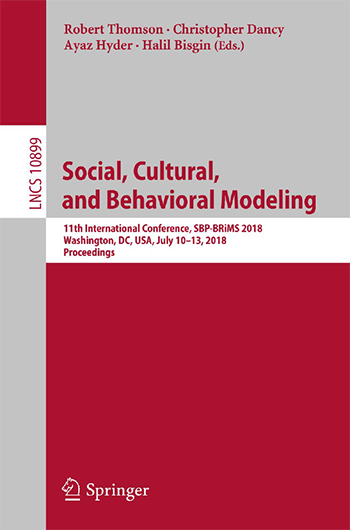 The SBP-BRiMS conference invites modeling and simulation papers from academics, research scientists, technical communities and defense researchers across traditional disciplines to meet, share ideas, discuss research results, identify capability gaps, highlight promising technologies, and showcase the state-of-the-art in applications in the areas of cultural behavioral modeling, prediction, and social computing. 2018: Since its online publication in July 2018, over 35,800 chapter downloads. 2017: Since its online publication in July, 2017, over 12,100 chapter downloads. 2016: Since its online publication in June, 2016, over 1,200 chapter downloads. 2015: Since its online publication in April, 2015, over 31,860 chapter downloads. 2014: Since its online publication in April, 2014, over 35,879 chapter downloads. 2013: Since its online publication in March, 2013, over 118,162 chapter downloads. 2012: Since its online publication in March, 2012, over 43,437 chapter downloads. 2011: Since its online publication in February, 2011, over 23,898 chapter downloads.